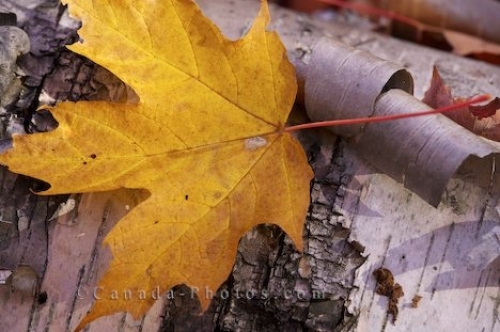 A single yellow leaf lays across the bark of a tree as Autumn begins to steal the leaves from their branches in Algonquin Provincial Park in Ontario, Canada. Autumn makes its way into the forest along the road to Rock Lake in Algonquin Provincial Park in Ontario, Canada and each leaf that falls shows its natural beauty. This single yellow leaf has made its way to a fallen tree and rests here until a wind gust blows it farther on in its journey. Picture of a single leaf displaying its Autumn coloring as it rests on a tree in Algonquin Provincial Park in Ontario, Canada.